Phone companies are relentlessly chasing the bezel-less future of smartphones. What started off with the notches (big ones, small ones, teardrop ones) and shifted to pop-up cameras, and hole-punch cameras, also saw the attempt by a bunch of brands to use sliders as the solution to hide the front facing cameras, and make an almost-completely bezel-less smartphone. The Mi MIX 3 might well be the best example of the sliding design (Oppo Find X is obviously another great one), but now, it looks as though Asus is not only choosing to go with the slider design, but also rethinking it to make it more useful, in some senses, and probably a hell of a lot more gimmicky in others. In a tweet made by famed leakster Evan Blass, he shows off concept renders for two different dual-slider designs from Asus. The first one, shows off a phone that slides up on the top to bring out the dual front cameras, one of which is apparently a 120-degree wide-angle camera for group selfies, along with an entire strip of LED flashes. The bottom slider, on the other hand, shows off a Harman Kardon speaker system. It looks unique, and if it becomes a reality, the sound quality on this might be one of the best in class, but that’s to be seen. 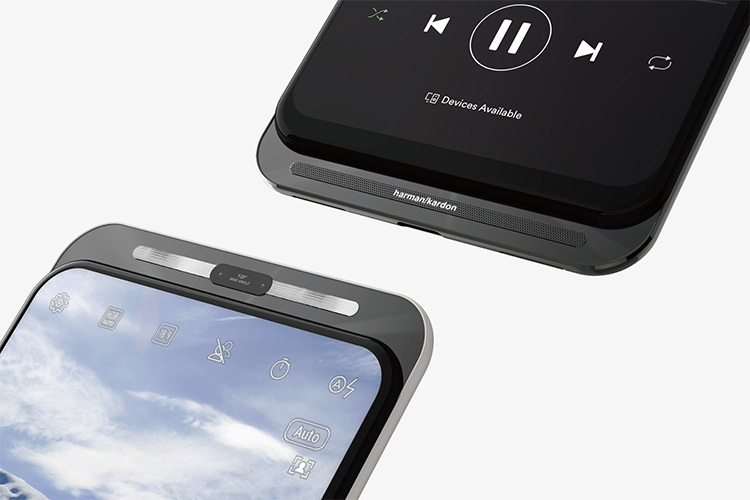 The other render shared by Evan Blass, shows off an Asus phone, again with dual sliders, and again with the top slider bringing dual front facing cameras and two flashes, while the bottom slider is shown to have a touch-screen that brings contextual buttons (like EV, zoom, and a shutter button for the camera app, as shown in the render). That reminds me a lot of the TouchBar MacBook Pros, and it’ll need a lot of support from developers to actually make this bottom slider useful. But, we can presume that the pre-loaded apps will come with some sort of support for it (if and when this smartphone becomes a reality, that is). However, developer adoption of a feature like this will probably not be the best unless other smartphone brands decide that a contextual touch screen that slides out is a great idea, and start copying it in their smartphones, compelling developers to provide support. Obviously, these are concept renders (so take these with a pinch of salt), and there’s no guarantees of any sort that Asus will actually make either of these devices, but if they do, it’ll definitely be a bold step from the company, and one that I’d really like to check out. I just hope it doesn’t die the death that the MacBook Pro TouchBar did, because no one uses it, honestly.